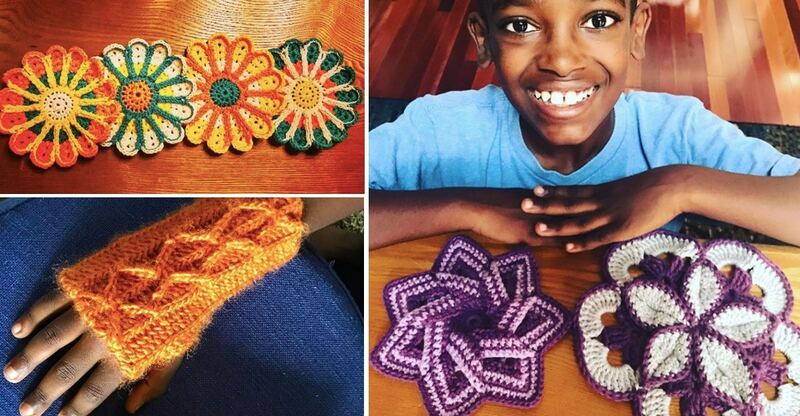 This 11-year-old who loves to crochet has become a viral phenomenon. Jonah Larson found a crochet hook in a box of craft supplies when he was five. Six years later, he’s a viral crocheting phenom. The 11-year-old didn’t set out to become a crocheting prodigy, but after he found a tutorial on YouTube at age five, he was (pardon the pun) hooked. Since then, he has created countless crochet projects, from scarves to blankets to mermaid “legs” to stuffed octopi, and is showing no signs of slowing down. Jonah’s mother, Jennifer Larson, says that Jonah’s hobby comes completely from his own initiative, and he practices it between 4 and 5 hours a day. “He’s much more fascinated to see what beautiful thing he can make from that string of yarn than playing a video game,” she told the Lacrosse Tribune. Jonah has his own Instagram and Etsy shop, where he shares and sells his one-of-a-kind creations. With his mother’s help on the business end of things, Jonah shares his creations on his Instagram account and sells them through his Etsy shop. However, due viral news coverage creating an over-demand of his creations, the shop has been temporarily closed. This blanket was made with my fingers using loop yarn. Jonah sends some of his proceeds back to the orphanage in Ethiopia where he lived as an infant. Jennifer says that Jonah is learning to manage money and make wise choices with his earnings. He sends some of his profits back to the orphanage in Ethiopia where he lived before he was adopted by the Larsons as an infant. Jonah told NPR that he wants to be a surgeon when he grows up. With the skills he already has as a kid, no doubt he’ll have the dexterity and fine motor skills for the job as an adult. To top it all off, Jonah is just an incredibly sweet kid. Watch this video of him crocheting away while telling us to focus on the good things in the world, and you’ll see why he’s captured the hearts of so many people.